April Fool’s Day is my favorite holiday. There’s no pre-holiday stress. No gifts to buy. No cookies to bake. All it requires is a little creativity. I’ve replaced the filling from Oreos with toothpaste and nailed nickels to wooden floors. Amateur stuff. It’s hilarious to ask a friend to return a call to Mr. Lyon or Jim Panzee or even Ryna Soris. Calls go right to zoo switchboard operators who dread April 1. That’s small potatoes compared whoppers pulled over the years on an unsuspecting public. No one suffers more from 4/1 jokes than telephone operators in call centers, who ultimately have to explain it’s a joke and remind callers that it’s April Fool’s Day. Burger King pulled a whopper on April 1, 1998 with a full page ad in USA Today alerting meat eaters of a new menu item—the Left-Handed Whopper. Hoping to appeal to the 32 million American lefties, they rotated condiment placement 180 degrees so excess catsup, mustard, mayo or strands of onion fell out the right side of the sandwich. Thousands of customers arrived at counters and drive-thrus all over the country requesting the new burger only to learn they’d been duped. Two years earlier Taco Bell took out their own full-page ad in the NY Times letting people know they purchased the Liberty Bell and from that moment on, visitors to Philadelphia would visit the Taco Liberty Bell. Outraged patriots called the White House in protest. The press secretary knew it was a hoax, and played along. His response? The Lincoln Memorial has also been sold and from now on, it will be known as the Ford Lincoln Mercury Memorial. No one has ever managed to do a better job with an April Fools prank than the British. In 1957, Panorama, a very proper and respected news program, broadcast a news story about farmers in southern Switzerland who were experiencing a bumper spaghetti crop. 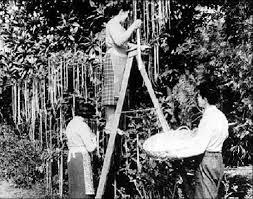 As news anchor Richard Dimbleby described the details of the spaghetti crop, viewers watched footage of a Swiss family harvesting strands of spaghetti from trees. The whole prank was dreamed up by one of Panorama’s cameramen, Charles de Jaeger. One of his elementary school teachers had declared he was “so stupid he would believe spaghetti grew on trees.” Who’s stupid now? As soon as the Panorama program ended, the switchboard was slammed with calls from viewers who waned to know how they could grow their own spaghetti. Someday, somehow, those call center operators are going to get even.